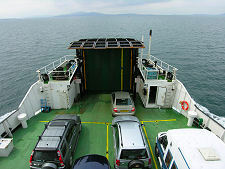 Summer 2003 saw the the Sound of Harris Ferry come of age with the introduction of the MV Loch Portain on the route, replacing the MV Loch Bhrusda. For current timetable and fare information for a service that now operates seven days per week, and for bookings, visit CalMac's website. Until June 1996 the only way to transport a car from Harris to North Uist was via the triangular service taking in Uig on Skye as well as Tarbert on Harris and Lochmaddy on North Uist. 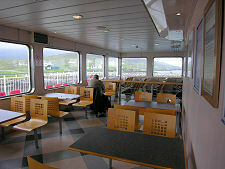 On many days the trip from Tarbert to Lochmaddy took four hours via Skye. The only alternative was a passenger-only ferry between Leverburgh, Berneray, and Otternish on North Uist, a journey that could be exciting at certain states of the tide. 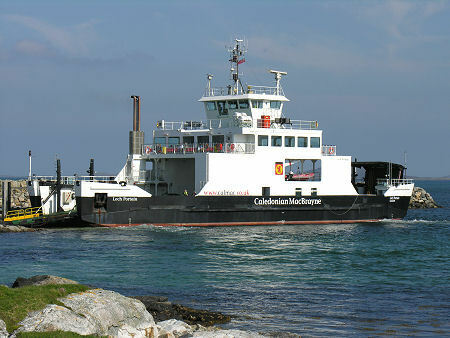 A vehicle ferry service across the Sound of Harris began with the arrival of the MV Loch Bhrusda in 1996. This 250 ton vessel could carry up to 18 cars and was built for CalMac by McTay Marine in Liverpool. It used a novel propulsion system that allowed it a high degree of manoeuvrability in these shallow and rocky waters. For the first few years the service connected Leverburgh with a slipway at Otternish on North Uist. 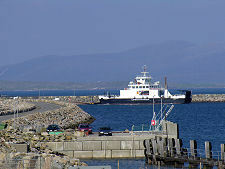 This changed with the opening of the Berneray Causeway in April 1999, and the ferry's southern terminus is now a purpose-built slipway in a new harbour at the causeway's northern end. Traffic using the ferry has increased dramatically since 1996, by far more than anyone had predicted. 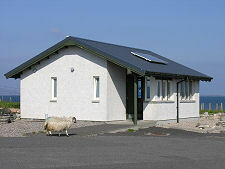 This "new ship" effect and the stream of people using the ferry have brought a number of new developments in Leverburgh. 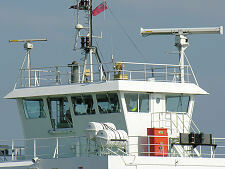 In Summer 2006 the service started to operate seven days per week (amid some controversy in Harris about Sunday Observance). 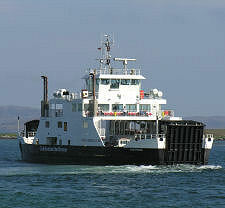 This made the northern half of the Western Isles accessible by ferry on a Sunday for the first time. 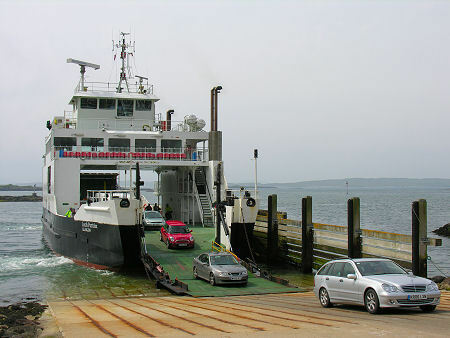 The MV Loch Portain carries twice as many vehicles as the Loch Bhrusda, and more passengers. It also has the benefit of being significantly less noisy than its predecessor, which by some margin was (and still is) the noisiest ferry operating in Scottish waters. The Loch Bhrusda has moved south to provide much more capacity than at present on the Sound of Barra service, using new harbours and slipways on Barra and Eriskay. 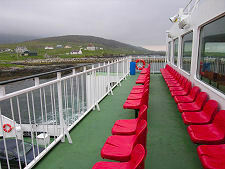 This has revolutionised the service there, much as it had done for the Sound of Harris route. 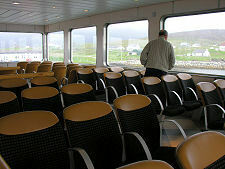 The Sound of Harris is full of islands, islets and rocks, and the route followed by the ferry is a roundabout one covering nine nautical miles in an hour. From Leverburgh the ferry skirts the islets near the Harris coast before heading south towards the north eastern tip of North Uist. Close to the island of Grodhaigh it takes a sharp right turn and heads nearly due west to the southern tip of Berneray. The receding views of Leverburgh and Harris tend to be intermittently interrupted by the islets in the sound, but those of Berneray as you approach give an excellent impression of this lovely island. When you emerge from the ferry take the time to explore Berneray before turning to head south across the causeway and onto North Uist itself.